Canaryskies.com Photo Gallery by Max Anderson - Top rated/Comet 8P/Tuttle. Canary Islands, Tenerife. 06.01.2008. 21.13. 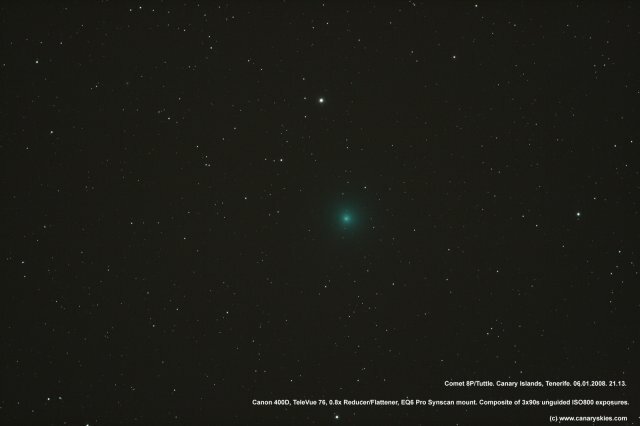 Comet 8P/Tuttle. Canary Islands, Tenerife. 06.01.2008. 21.13. Canon 400D, TeleVue 76, 0.8x Reducer/Flattener, EQ6 Pro Synscan mount. Composite of 3x90s unguided ISO800 exposures.